Kurt and I were involved in a discussion on the Trumpet Herald Forum a while back and we got sidetracked into a private discussion. I had asked Kurt if he would be willing to video tape his chops so I could take a closer look at them and he sent me the below video. Take a closer look and see if you can guess his embouchure type. My guess after the break. 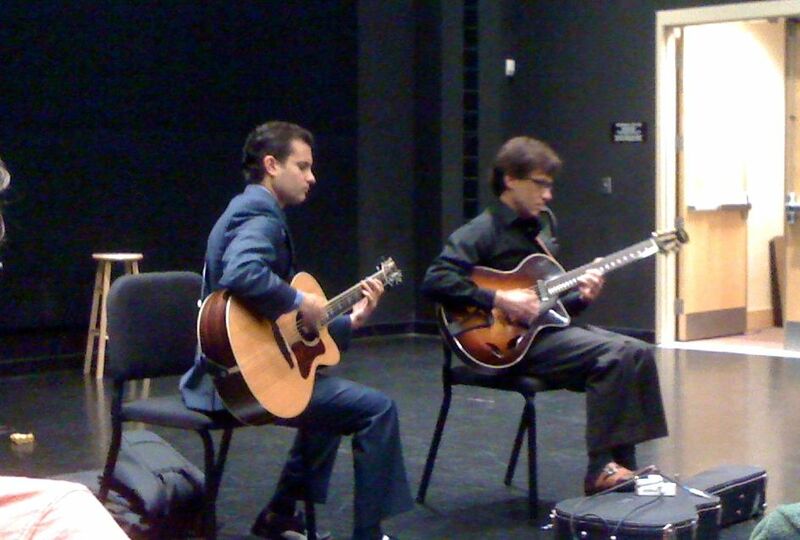 Last Friday, February 15, 2013, guitarist Frank Vignola came to Western Carolina University to perform. I was unable to attend the concert, but I did get to his master class earlier that day. He and his musical partner, guitarist Vinny Raniolo, spent a bit over an hour talking about jazz improvisation, the music business, practicing, and also performing a bit for those in attendance. I took some notes during the master class and here are some random things that Frank and Vinny discussed, in no particular order, and some additional thoughts by me. Frank commented that he has spent more time working on getting his music heard (finding gigs, promoting his recordings, etc.) than he has actually spent playing guitar. He pointed out that when he was first getting started that this was more difficult than today, and he urged the students to use available technology (YouTube, social networking, etc.) to help them with this side of their careers. Many opportunities for performing exist in places like hospitals, nursing homes, libraries, and coffee houses and such venues shouldn’t be overlooked by musicians just getting started. Every gig you play, Frank noted, is promotion for your next one. In response to a question about how to find a manager, Frank mentioned that up until recently he did all his own managing. He felt this was for the better as he understood his needs exactly and that some venues were more interested in speaking directly with the artist than to an agent or manager. That said, Frank said he does currently use a manager and booking agent for European tours and also one for North America, but only recently has he become busy enough to need this. Frank feels that making a connection with his audience is very important. He finds that doing things like announcing the songs and talking a bit about them makes for a big difference in the enjoyment the audience gets out of hearing his music, particularly when it’s an original composition or tune that isn’t very recognizable. He and Vinny actually went so far as to demonstrate how they step out on stage and bow to acknowledge the applause. Smiling and looking up towards the audience is also important, he argued. Frank mentioned a few jazz greats who he felt were particularly good and audience interaction, as well as noting that Miles Davis was an obvious exception who was able to get away with performing with his back to the audience. Practicing improvisation was a big part of the master class. Frank emphasized learning a lot of tunes, and in many different styles, and not just jazz standards but also rock, classical, and country tunes (he also offered that this is also simply good business sense). Frank said, “Learn 100 songs and you’ll have no problem improvising.” He recommended that students just getting started on improvisation begin by using the melody as a launching point and simply embellish the melody with things like vibrato, bends, and altering rhythms. Gradually step up to adding things like arpeggios and blues scale embellishments. While working with some of the students Frank seemed to emphasize not only working without a lead sheet, but also using your ears as much as possible. He had invited students to join him and Vinny on the concert later that night on the tune Take the A Train, and rehearsed a bit with the students at the end of the master class. One student was struggling a bit and she pulled out a fake book to read the changes. Frank insisted she close the book and instead helped her by prompting her on the chords while playing. After a couple of choruses or so through the form she no longer seemed to need the sheet music, and I suspect she probably learned the tune faster this way than she would have if she kept reading out off the lead sheet. Speaking of reading music, Frank encouraged the (mostly guitar) students to really work on their sight reading skills. He suggested spending time every day sight reading something new. He acknowledge that TAB notation has it’s uses (learning how a player might have played a particular line, for example), but feels it is much more beneficial for guitarists to avoid too much TAB and instead focus on learning how to read a standard lead sheet notation of melody with chord symbols. Frank did spend some time speaking on issues specific to guitar players, but I found some of this interesting and relevant to trombone playing. For example, he recommended that guitarists spend time working out how to play the same licks and scales starting in different hand positions, starting on different fingers, different strings, and even playing only on a single string. While trombonists don’t have as many options for slide positions and guitarists do with all the combinations Frank made note of, I’ve found practicing patterns utilizing different slide position combinations very useful for general slide facility as sometimes a line ends up in a slide position that makes and alternate slide pattern fit better than the more typical one. Frank also discussed some of the different methods of picking. He mentioned that he prefers all down strokes whenever possible and alternates for very fast passages. That said, he stated he liked to play with an up stroke for chord melodies as this approach will have the melody note (usually the top note in the voicing) sound first and bring out the melody a bit more this way. All in all, I found Frank Vignola’s and Vinny Raniolo’s master class to be both informative and enjoyable, even as a non-guitarist. They both played great, were positive yet honest, and had interesting and helpful thoughts to offer. I’m sorry that I wasn’t able to make their performance, but heard that it was well attended by an enthusiastic audience and I’m pleased that students at WCU were able to have the experience of sitting in with two extremely fine musicians in performance. If you’re not already familiar with Frank’s and Vinny’s playing, check them out in this YouTube video. 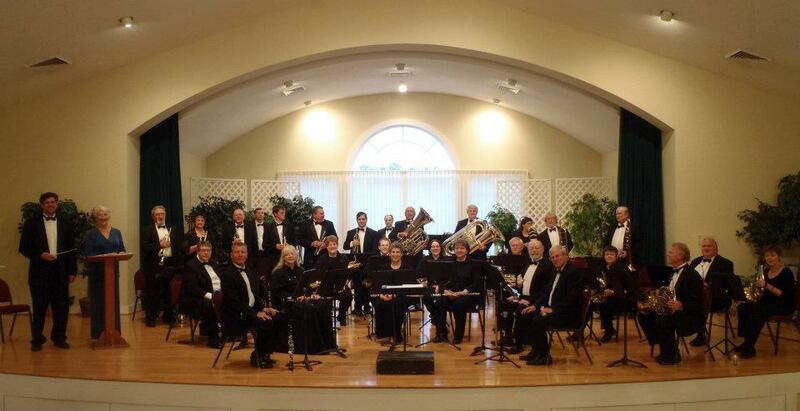 This Saturday, February 16, 2013, the Land of the Sky Symphonic Band will be performing a concert at the White Horse Black Mountain, in Black Mountain, NC. The concert starts at 8 PM and tickets can be bought at the door for $15. I enjoy performing a wide variety of music, so as the conductor of this group I try to select a lot of contrasting pieces. We’ll be performing a lot of traditional concert band repertoire on Saturday, such as Commando March by Samuel Barber, but also some non-traditional pieces as well. For example, we’re playing a fun transcription of Rossini’s Overture to the Barber of Seville. There are some lighter pieces on the program, such as a medley arrangement of music from the musical My Fair Lady. A couple of the musicians in the group found a whole bunch of music that I wasn’t familiar with and we’re trying out a couple of those pieces too. One is called Caribbean Fantasy, composed by John J. Morressey. Another, Timpat by Robert L. Leist, will feature Dr. Mario Gaetano on timpani. Mario, a regular member of the ensemble, is the percussion teacher at Western Carolina University and a very fine musician. If you’re in the area this weekend please come on out and listen to a very fine group and be sure to say hello during out intermission or after the performance. About a year ago Stephan had some questions about my dissertation (The Correlation Between Doug Elliott’s Embouchure Types and Selected Physical and Playing Characteristics Among Trombonists) and I sent him a copy (in case he had insomnia). Recently he emailed me to ask about a bass trombonist friend of his who has been frustrated with some embouchure struggles he’s been having. His friend is worried about how his tooth structure might be affecting his tone quality. I asked him if he could take some video of his friend’s chops and Stephan came through with something I didn’t expect. Because it’s in high speed there’s no sound (filmed with 600 fps and replayed with 30 fps, which results in slow motion factor of 20), which makes it actually a bit harder to put what we’re seeing in context. Still, I am able to spot two things that I would recommend Stephan’s friend might try out. Take a close look at the video below and see what you think. My thoughts after the break. Music for me is like religion. In every religion there are the preachers who are touring all over the world to preach about religion, and the monks, who sit in a basement, practice for themselves, and teach others. I am the monk. My first exposure to the work of Banacos comes from David Carlos Valdez’s excellent blog, Casa Valdez Studios. A couple of months ago Valdez posted some information and links about Charlie Banacos. Included in his post is a link to a dissertation by Lefteris Kordis called “Top Speed and in All Keys”: Charlie Banacos’s Pedagogy of Jazz Improvisation. Kordis goes over the different types of exercises Banacos would assign to his students. The exercises cover nine facts of technique and musicianship–which I have organized in Sections A – I. In Section A, three popular ear-training exercises plus a meditation practice are presented. These exercises are useful for the development of various aural skills, such as relative pitch, perfect pitch, and intonation. In Section B, ten prominent exercises for instrumentalists/vocalists are listed, which focus on enriching improvisation skills, expanding melodic, harmonic, and temporal vocabulary, and improving technique. Section C includes a list of names of voicing exercises for chording instruments, such as piano and guitar. Banacos taught composition to a variety of instrumentalists and singers. In Section D are some composition exercises he assigned, some of them based on Joseph Schillinger’s System of Musical Composition. Section E features four prominent exercises for rhythm, and Section F, three exercises for sight-reading/sight-singing. Banacos’s explanations for practicing the assigned repertoire, as well as for overcoming technical limitations, are listed in Section G. Some of the exercises included in this section were intended to further enhance instrumental technique. Section H illustrates Banacos’s approach to building repertoire, which consists of jazz standards as well as classical piano works. I haven’t gotten through the whole paper yet, but it looks excellent and should be valuable for teachers and players alike. While I’m at it, please go visit Casa Valdez Studios for an excellent blog for jazz musicians and saxophonists. Here’s a link to a great site of jazz transcriptions and other resources from Bert Ligon at the University of South Carolina. There’s a whole bunch of great stuff in there.